Zpocalypse is a survival board game set in a post apocalyptic nuclear wasteland. Two to four players start in a cold war fallout shelter opening the hatch door to a world torn apart from the walking dead. Players work together to fortify their base by adding walls, sand bags, defense towers and more. However that wont hold the dead out for long, and you’re getting hungry. As in any survival game one needs food, guns, ammo and more. Players go out into the wasteland and scavenge for supplies, maybe even find a new gun or melee weapon to fend off the next zombie attack. Characters receive victory points for killing zombies, building defenses, and using skills. Victory points dictate who wins the game, as well as act as experience points for leveling up their character. The game combines combat, resource collecting, character development, team play, and strategy towards the goal of surviving in the Zpocalypse! Here is an overview of Zpocalypse, showing prototype components! Interview with the game's artist Rick Casdorph. 1. Theme: The zombie theme is carried out nicely throughout the game. 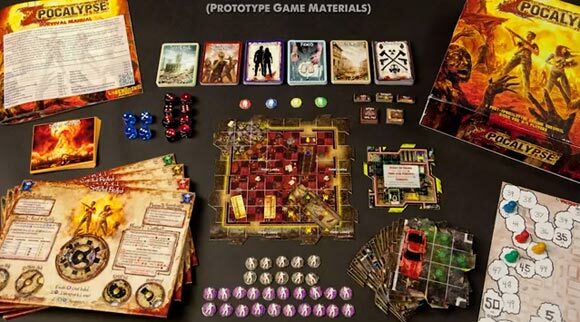 From the dice (red with bullet holes and blue with bullets) to the zombie miniatures to the victory point tracker board that captures the feel of a destroyed city being ravaged by a zombie outbreak, the theme in Zpocalypse is not simply “pasted on,” rather, it permeates every aspect of the game. Furthermore, the dread that comes with battling against this horde of undead zombies mounts as the game goes on, adding to the tone of the game. 3. Originality: I really dig the overall approach of the game. 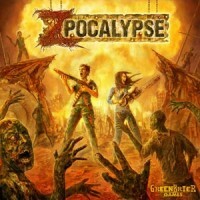 Sure, there are a lot of zombie-themed games on the market (and I own many of them), but Zpocalypse brings something new to the table. Each player is controlling a squad of survivors, rather than just one individual, and there is strength in numbers. The squad statistics are managed with a heavy duty board that has handy dials to make updating those stats a cinch. Also, rather than simply rolling the dice and fighting zombies until the bitter end, this game incorporates other survival aspects, such as scavenging for food and supplies, and building fortifications. 1. The Rule book!!! – This to me was almost a deal-breaker, as the rule book was detailed, but very often unclear. Typos present often made the instructions hard to follow (the numbered list starts at 6 and the user is directed to repeat steps 3-7 again, but where are steps 3-5 located?). Words were replaced with tiny icons so that I felt as though I was reading ancient hieroglyphics or a Highlights magazine. Pages were cluttered with examples that were hard to read and complete with images for examples that had unclear descriptions, if any. Ample pages were spent outlining the different elements of the game separately; however, there wasn’t a decent job providing a simple, straightforward turn summary or player reference sheet. Certain actions happen multiple times in the game, and it isn’t clear when exactly the action needs to take place, so having a more holistic narrative would have helped clarify the game play. Minutia was explained thoroughly; however, game basics were glossed over. 3. The board design – While I like that the board segments are sturdy and lock together to keep from shifting, I find the design of the board to be problematic. Everything is a bit too cluttered to be able to tell what you are seeing, where the spaces are, which spaces can be landed on, and other information about the tiles. The confusing jumble of images is overwhelming to take in, and while that may be the affect the designer was attempting to achieve, I found it slightly off-putting and an obstacle to be dealt with. To really understand the game, IMO you’ll have to hit YouTube and watch a game play video. That, combined with our first failed attempt to play the game, seemed to work for us. Now, we are able to play the game easily. We find it to be very enjoyable and it is now a regular at our table. In summary, it can be hard to learn, but is well worth it for the new aspects the game incorporates (e.g., searching for resources, building fortifications) as well as the zombie-killing mayhem. Add a Review for "Zpocalypse"